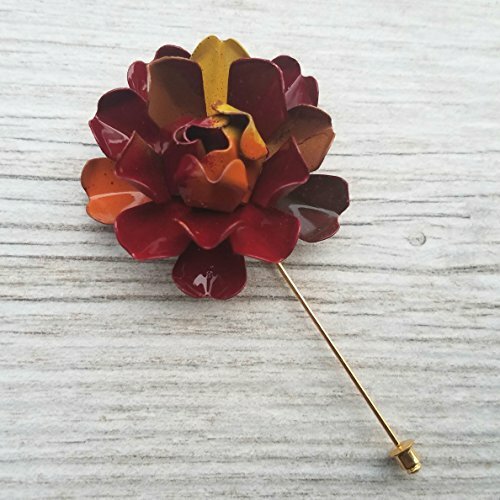 A multi layered metal enamel lapel pin in fall leaf colors - shades of brown, red, orange and yellow. This bone rosette flower measures 1 7/8" across (@5 cm) and is made of thin layers of brass, so it's sturdy but still lightweight. The length including the pin is 3 1/2" (8.3 cm) Each one will have very slight differences as they are individually cut, bent and painted. The pin is gold tone metal with a safety clutch. Comes packaged in a kraft gift box.